those mature couples that are in love with golf, since the hotel is surrounded by the San Domenico Golf Club. 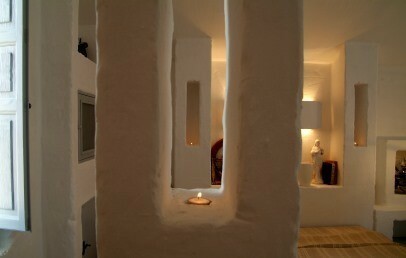 The Masseria Cimino is located in Savelletri on the Adriatic coast and very close to the San Domenico Golf. The airport Bari distance 55 km and the airport of Brindisi 50 km. From the first hole of the itinerary of the San Domenico Golf course you can see a red tower which stands out from the blue of the sky and the sea from which it is surrounded. The tower of the Masseria Cimino was built in the 18th century and it is only a few metres away from the sea and the archaeological site of the ancient Roman city of Egnatia, which dates back to 6th century b.C. 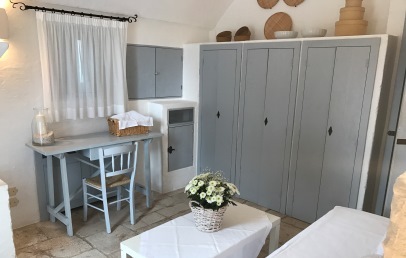 The Masseria Cimino has been completely refurbished in 2005 and has now a beautiful swimming pool in tuff, with magnificent view on the Golf course and the Masseria. 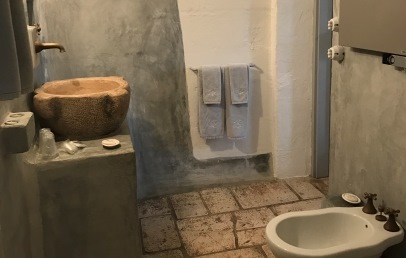 The Masseria Cimino, has 11 rooms and 3 suites, some of which are located in the ancient tower, whereas the others are in the houses which border an archaeological site. Rooms are furnished in Mediterranean style and have every comfort like air conditioning, safe, minibar, plasma flat screen TV and Wi-Fi connection free of charge. Some have fireplaces in stone, others have magnificent balconies, right in front of the golf course and panoramic view. Suite del Massaro has a bedroom, a livingroom, two bathrooms with shower, two mini fridges, and two satellite tv with flat screen. The suite has direct access to the golf course. Suite Torre is located on the first floor in the old red tower, consists of a double bedroom, living room with fireplace, en-suite bathroom with shower and terrace with panoramic view. Suite Mare consists of a double room with a sea view balcony and a living room with small veranda overlooking the atrium of the Masseria. 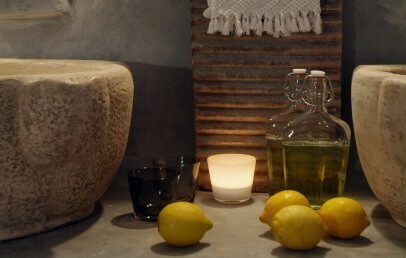 The Masseria has a restaurant, a Bar & Lounge and a relaxing swimming pool. It provides also free Wi-Fi both in the rooms and in the common areas and bicycle rental for free. In the nearby there is a 18-holes Golf course San Domenico Golf Club and it is possible rent a boat for daily excursion. The Standard rooms are located on the ground floor, except one on the first floor. Some have the bed with masonry construction, which does not allow the separation of beds. Decorated in Mediterranean style, they're equipped with bathroom with shower and offer different views: some of the sea, others on the golf course, and still others to the inner courtyard. Most of them dispose of a romantic fireplace. 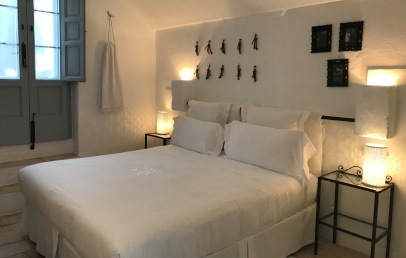 Suite del Massaro with bed with masonry construction (which does not allow the separation of beds) located on the ground floor and decorated in Mediterranean style. It has a separated living room with fireplace and a sofa bed (for a maximum of 3 people in room). This spacious Suite has 2 bathrooms with shower and offers a view over the courtyard and the close golf course. Located on the first floor in the red tower, Suite della Torre was the ancient room of the farmer and still features a classical and typical style. 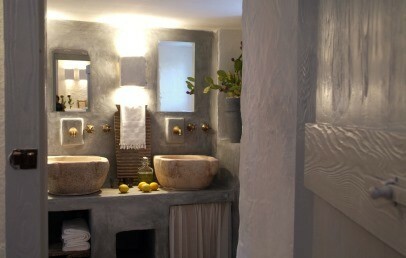 It consists of a double room (13 sq.m.) 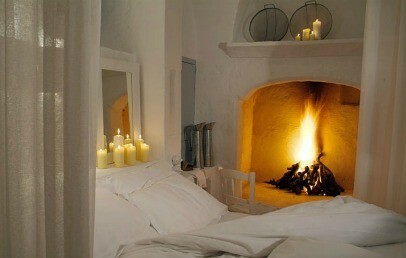 with wrought-iron bed, living room with fire place (20 sq.m.) 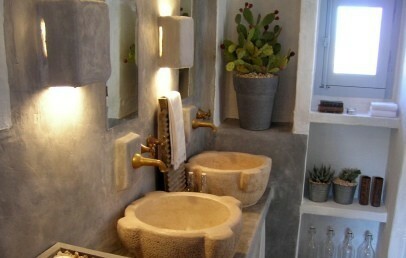 wood furniture and white walls, en-suite bathroom with shower. The Suite della Torre overlooks a terrace with panoramic view. 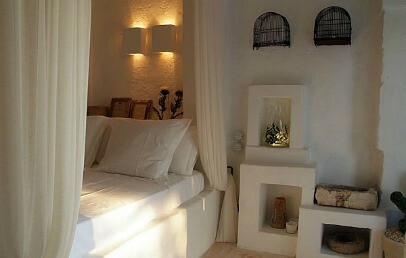 The Sea Suite consists of a double room (possibility of twin beds), a separate living room and 2 bathrooms with shower. 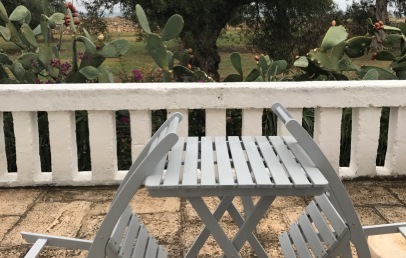 The double bedroom has a balcony with sea view, while the living room has a fireplace and a small veranda overlooking the atrium of the Masseria. The Suite is furnished in Mediterranean style and equipped with all comforts, including air conditioning, safe, minibar, TV and Wi-Fi. In the lounge you can provide up to a maximum of 2 extra beds.